2015 was filled with some big changes. Sean and I took the leap and moved in together, so I wanted to craft something special to display in our apartment. I’ve definitely had this idea for awhile and even saw a few similar to this in some local craft stores. But have no fear, you too can make this extra special gift for a loved one (or yourself) and it will only cost you a fraction of the money! I chose to make my own “polaroid” images, but feel free to hang whatever you like from this display (greeting cards, handwritten messages, drawings, etc). The beauty of it is that it really can be customized however you like. 1. Take apart the frame and carefully remove the glass. 2. 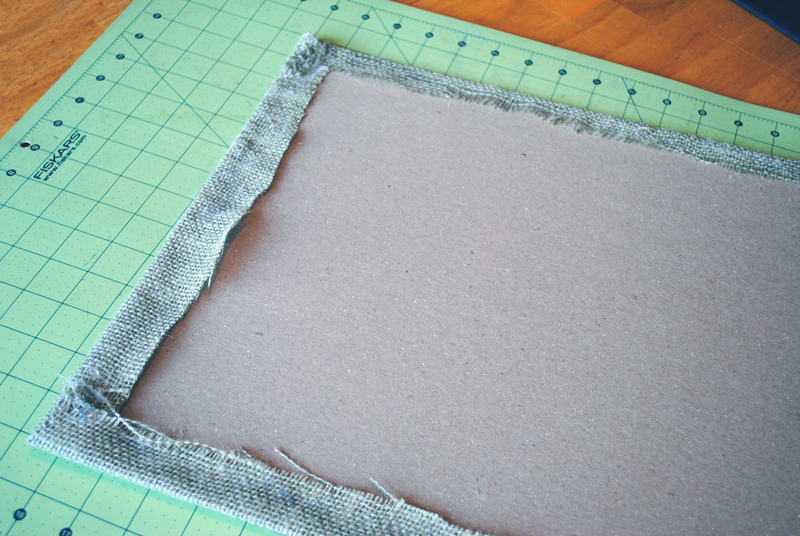 Measure a piece of burlap fabric that is about 1 inch longer than all 4 sides of the cardboard backing of your frame. 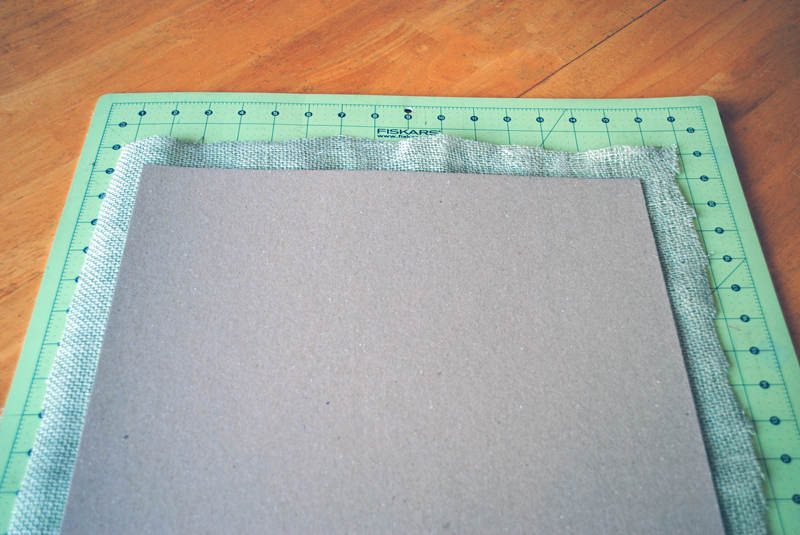 Then, using a hot glue gun, secure each edge of the burlap to the board. Be sure to pull the burlap taught. *Tip: Instead of gluing the edges in a clockwise/counterclockwise order, begin by gluing one side and then continue to glue the side that is opposite to it. This will prevent the burlap from bunching in the corners and will ensure an even surface. 3. Using the frame, measure the length of the twine so that there are at least 2 inches hanging off the edge on both sides. Depending on the size of your frame, you can create more or less rows of twine to hang your items from. 4. Keeping the twine straight, place the cardboard piece back into the frame. At this time, you can fiddle with the twine and position them accordingly. Be sure to leave enough room between each piece for the items you are going to display. 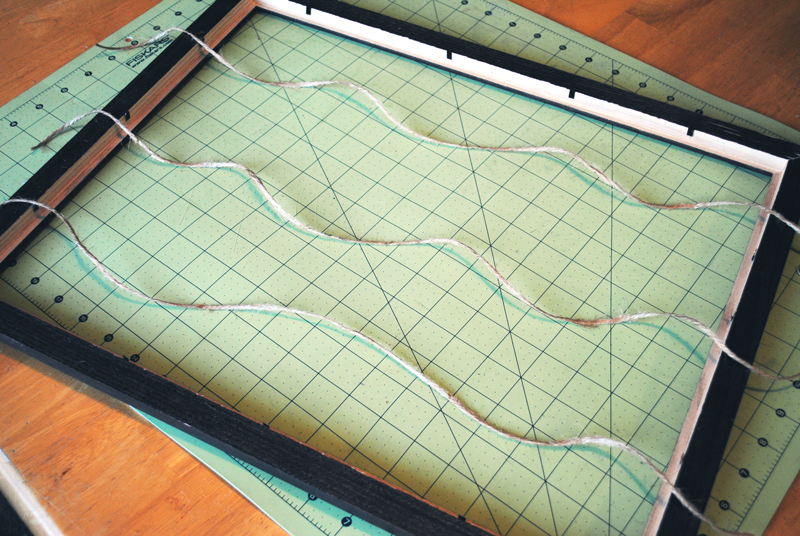 Once they are in place, flip the frame over and hot-glue the twine to the back of the cardboard. 5. To create the mock-polaroids, import a selection of photos into Photoshop and add a white border to them (Instagram photos work great for this because they are already cropped square). To make your photos look authentic, size the bottom white margin a little more than double the size of the other margins so that it leaves room to write a caption, date, or quote. 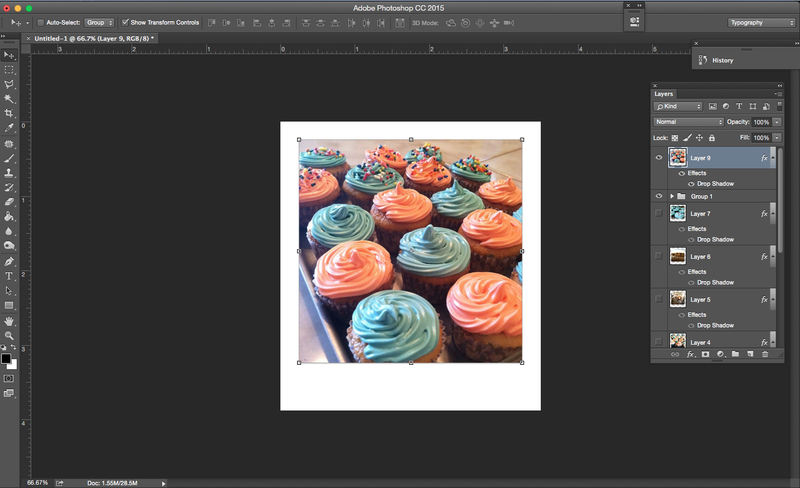 Once you have all of your images collected, print them out on a glossy paper and cut them down to size. 6. At this point, feel free to experiment with some decorative elements to enhance your photo display. Adding a bit of color, shape, and texture can really bring your photos to life. Using a triangle template, I cut out triangle shapes from colored paper, glued down the flaps, and punched holes in the top two corners of the triangle. *Tip: To create bunting that is removable, I cut a small slit from the punched hole to the side edge of the triangle (which remains hidden behind the twine). This allows you to position the bunting exactly how you want it without committing to stringing the twine through both holes. 7. 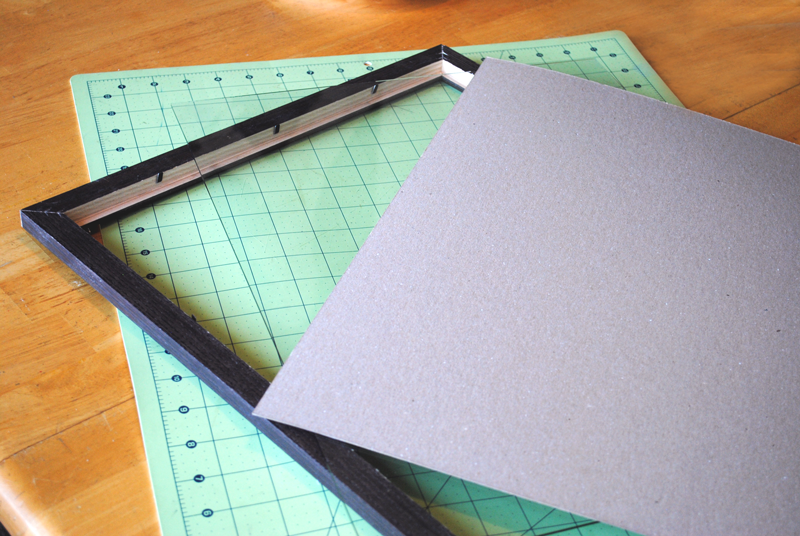 Before you attach any of your pieces, position all of your photos and decorative elements onto the board while it is laying flat on a table. Then, using the small clothes pins, hang your photos from the twine so that it appears that they are hanging on a clothes line. And there you go! 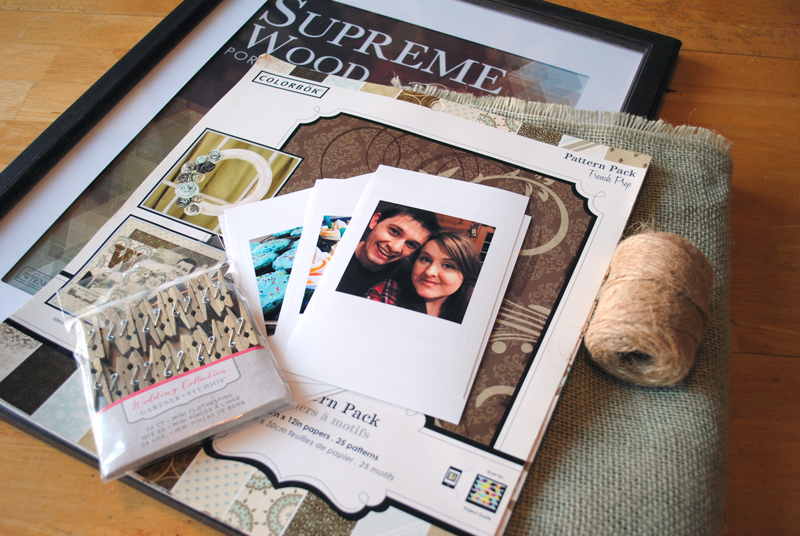 A personalized photo display to show off your favorite memories. 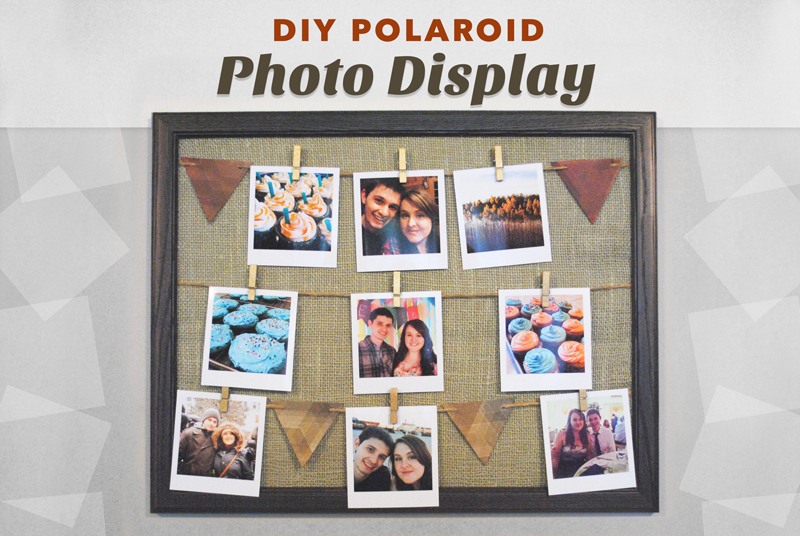 The fun of this DIY is that almost everything can be customized to your liking to create a unique photo display. Maybe your frame is big and bold. 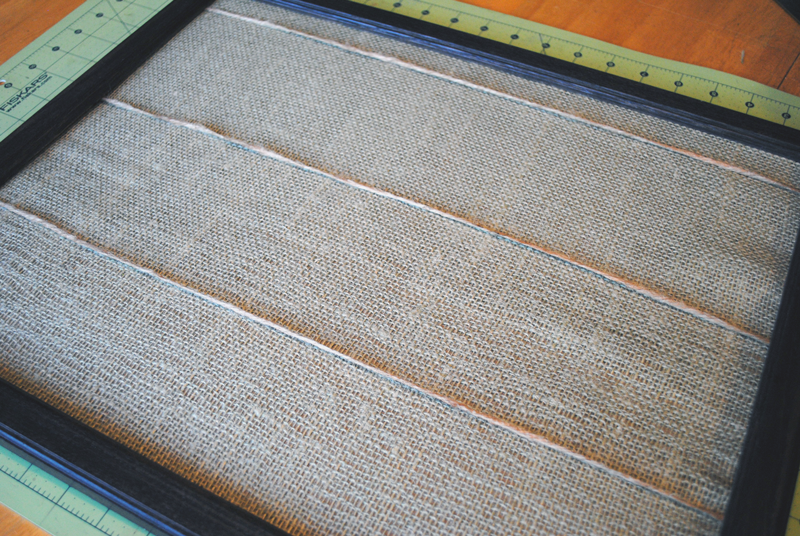 Maybe instead of burlap, you wrap the back of your frame with a bright patterned fabric. Hang christmas cards, movie stubs, or feathers from the twine.